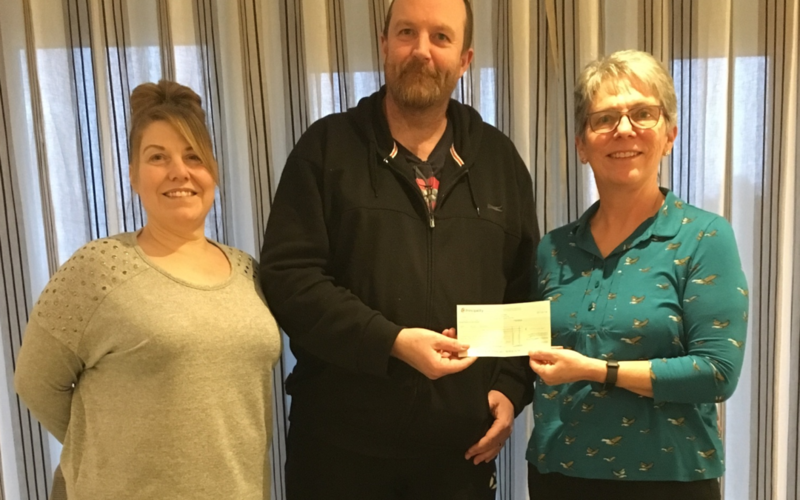 John Morgan, who at the start of 2019 took part in the Saundersfoot New Years Day Swim, has collected a fantastic amount of sponsorship for his challenge and recently presented a cheque to Karen Shreeve (LLMF Chair). Here, in John’s words are the reasons he decided to raise lots of money for LLMF(Wales). We sincerely thank John, his family and his very generous supporters for their fundraising. It certainly looked like they had lots of fun too! I was diagnosed with Non-Hodgkin’s follicular lymphoma in August 2016 and was placed on a watch and wait. In September 2017 I needed to start chemotherapy and was introduced to my chemo nurse (who is great). From the October I underwent six months of treatment on Ward 11 at Singleton Hospital. I can’t praise the staff and the ward enough, sitting in the ward for two days of treatment every month is hard, but the warm and friendly atmosphere provided by the staff there made the time pass and the whole experience doable. On completion of my six months of treatment I needed to go on to a two-year maintenance plan and have treatment every eight weeks. I wanted to give something back as a thanks for the support and treatment that I had and am still receiving. Due to the treatment I am unable to run a marathon (to be honest I couldn’t run one before I was ill) or anything as demanding, so my wife Tonia (who has been fantastic through this) and I started looking for something we could do to raise some funds for Ward 11 and we decided to give the New Year’s day dip for a go. We were told about the LLMF (Wales) charity and they sent me the information pack to start my fund raising. The build up to the event was a little nerve racking as we hadn’t done anything like this before and people were getting rather creative with ideas of how we should do the dip, from multi coloured tutus to a mankini. I was offered higher sponsorship to go in different clothes, but people didn’t know how we were going to be dressed until the day. We planned our outfits and we made sure that we arrived early as we didn’t know what to expect. The event was well organised. We were on the beach at 11.30am even though it wasn’t due to start until 12.30pm. Once there I changed from my ‘Santa’ costume to ‘Santa’s Day Off’ costume, complete with the requested coloured tutu and a mankini. Tonia was dressed as ‘Goofy’ and my youngest daughter dressed as ‘Sulley’ from Monsters Inc. There were lots of photographers and coverage from different press organisations. Music and dancers were there to get everyone warmed up and ready, followed by the usual health and safety speech. Fireworks signalled the start the dip, we went into the water which I have to say wasn’t that cold (lucky it was a mild day) until you submerged certain body parts! After the initial shock it was fine I even went back in for a second time! On leaving the water we were all given a medal to show that we had completed the challenge. It was a great day and I would do it again in a heartbeat. I was overwhelmed by people’s generosity for such a great cause and we managed to raise a fantastic £910.50.